»Seed Savers Series»Salem Public Library Author Event! Salem Public Library Author Event! I will continue my series on the Heirloom Expo after this announcement for Authorama. I will be taking part in this tomorrow, Saturday, September 20, 2014. 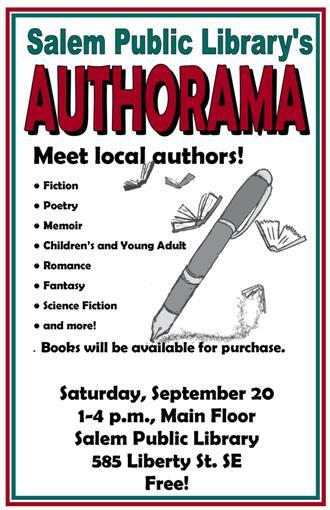 Salem Public Library presents Authorama, the Library’s third annual local author fair, on Saturday, September 20, 1-4 p.m. This free event will take place on the main floor at the Central Library, 585 Liberty St. SE. Authorama is Salem Public Library’s way of recognizing and honoring our diverse local writers, and it will give those who attend a chance to discover new writers and to network with those who have successfully published. Over thirty authors from throughout the Willamette Valley have accepted the Library’s invitation to participate. Copies of the author’s works will be available for purchase and signing. And if that’s not enough, there will be prizes! Many genres will be represented, with offerings including fiction, local history, romance, children’s and young adult fiction, science fiction/fantasy, memoir, and more. Participating authors include Gina Ochsner, recipient of the Oregon Book Award for People I Wanted to Be; Joy V. Mazeikas, author of Egg Song, a tale about a year in the life of three endearing backyard hens; David Koop, author of Cancer, It’s a Good Thing I Got It! The Life Story of a Very Lucky Man, gold medal winner of the International Book Awards Competition; former Oregon State Archeologist Leland Gilsen, author of a work of fiction called Diggin’ It; and many more. A complete list of participating authors is available on the Library’s website under “Events and Programs” at www.salemlibrary.org. For more information, visit Salem Public Library’s website or call 503-588-6052.